There's probably not a more effective way to show off a political message or a personal statement than by wearing it on a T-shirt for all to see as you walk. Pass people in the mall or grocery store, and instantly they've beared witness to your charming sense of style, or perhaps your love and admiration of an old cartoon show. When you see someone with a T-shirt that you like, it's always classy to exclaim "Nice shirt" to let them know you agree and enjoy their taste of clothing. Perhaps with this Triumph T-Shirt, produced by MetroRacing, you'll be the person that everyone is saying "Love the shirt" to. 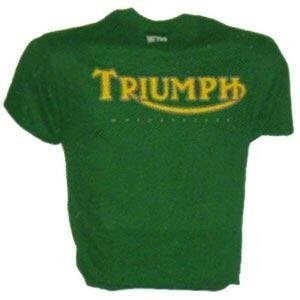 Besides just being a stylish logo silk-screened on a 100% pre-shrunk comfortable cotton shirt, the Triumph name immediately brings to mind the beautiful motorcycles that have been produced since the company was founded in 1885. If you happen to own a Triumph, use this shirt as a conversation starter to talk with fellow owners. If you can't afford a Triumph bike, buy the shirt and use it as a reminder of what you'll purchase when you win the lottery. The shirt is available in green, black, and white in various sizes.